Last night for dinner, we had a deliciously healthy salad. It was a mixture of organic baby greens and roasted butternut squash that was dressed with a spicy mustard and chili vinaigrette. 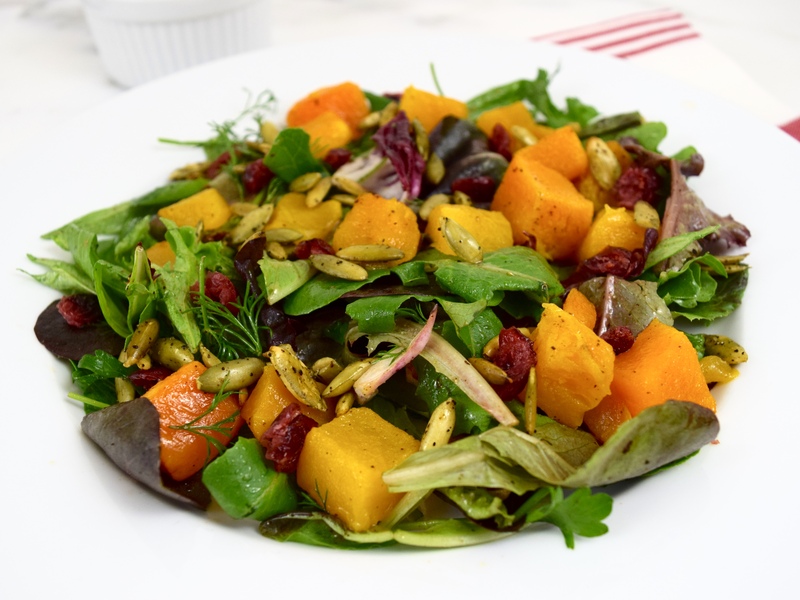 The salad had sweetness from dried cranberries and crunchiness from toasty pumpkin seeds. What made this so simple was I brought organic squash that was already peeled and cubed. My recipe was adapted from Health magazine, November 2015. 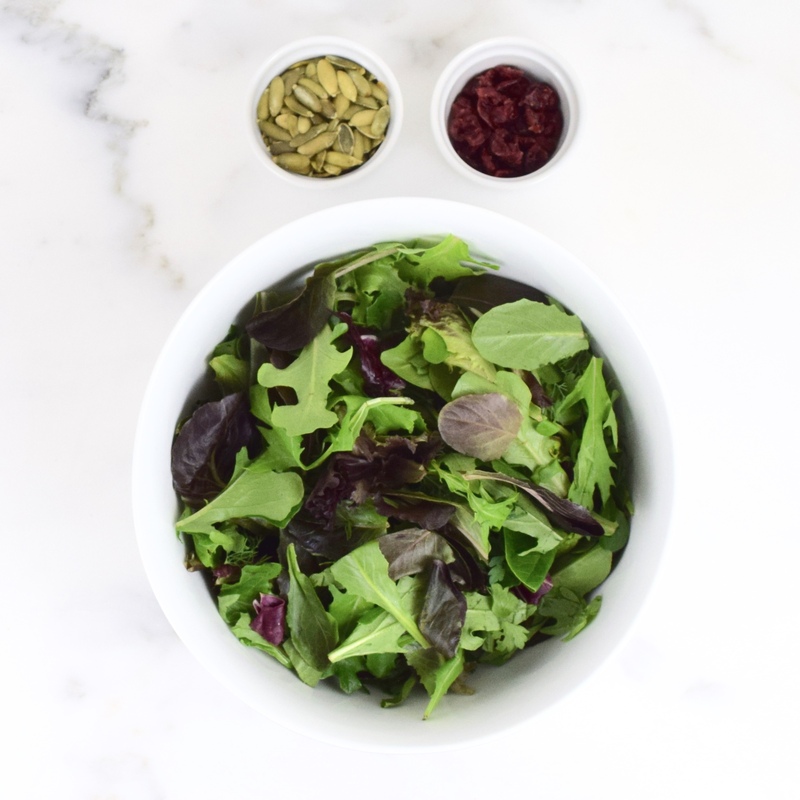 This salad was a colorful and wonderful light meal for fall! Preheat oven to 425 degrees. Line a rimmed baking pan with aluminum foil. 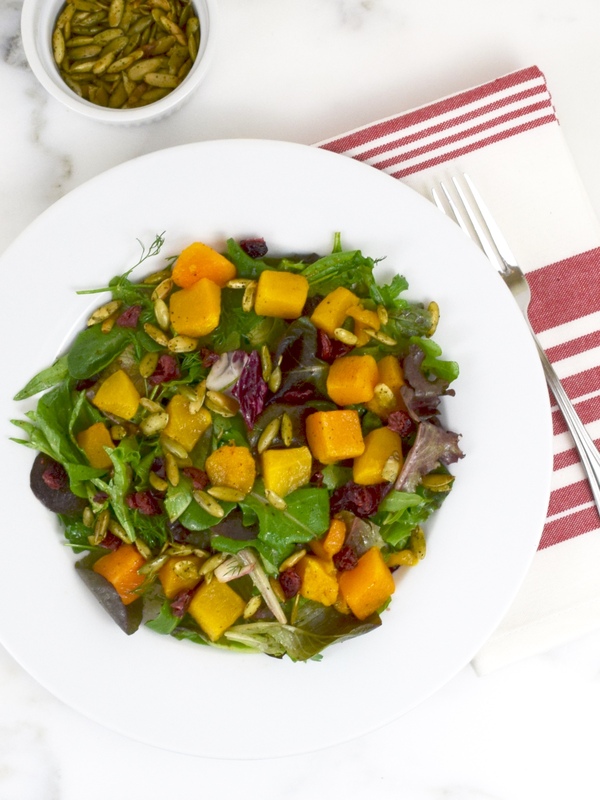 Toss the squash with 1 tablespoon grapeseed oil and spread over pan in a single layer. Place in oven and roast for 30 minutes. While squash is roasting, whisk together in a small bowl the syrup, vinegar, mustard, ¼ teaspoon chili powder, ⅛ teaspoon salt, cumin and ⅛ teaspoon cayenne. 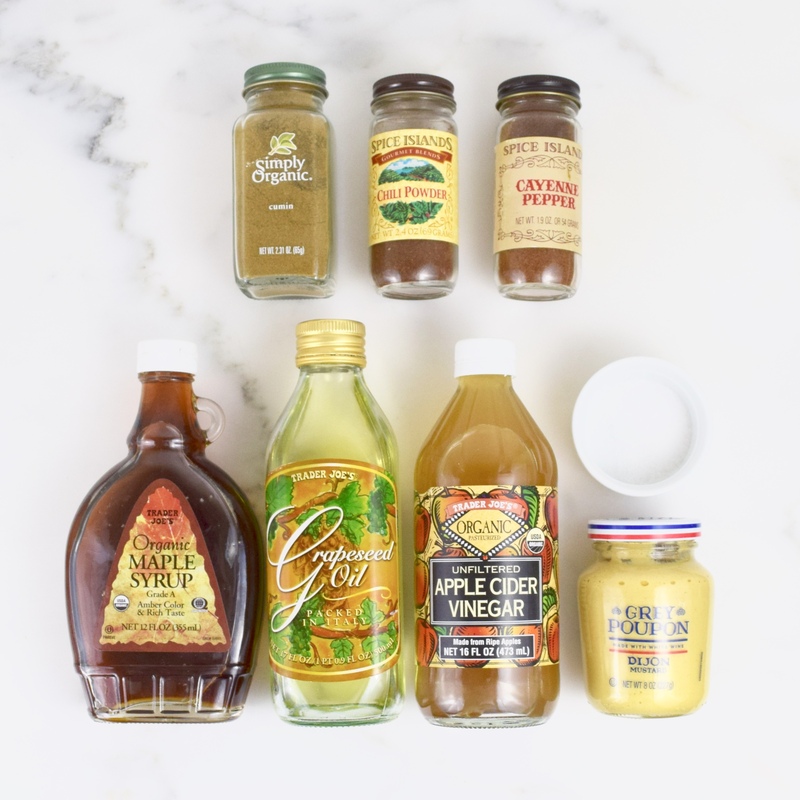 Add 3 tablespoons grapeseed oil in a slow steady stream while whisking. After squash has been in the oven for 30 minutes, stir and brush with 2 tablespoons vinaigrette. Place back into oven and roast until golden brown for about 15 minutes. In a medium skillet over medium heat, stir the pumpkin seeds with 1 teaspoon oil. Add a pinch of salt, chili powder and cayenne. Stir well. Toast for about 8 minutes. Toss greens with vinaigrette. Serve greens on 4 individual plates. Sprinkle with cranberries and pumpkins seeds. Finally, add butternut squash. 4 servings. This looks fantastic! I am loving all the fall squashes on your page lately. 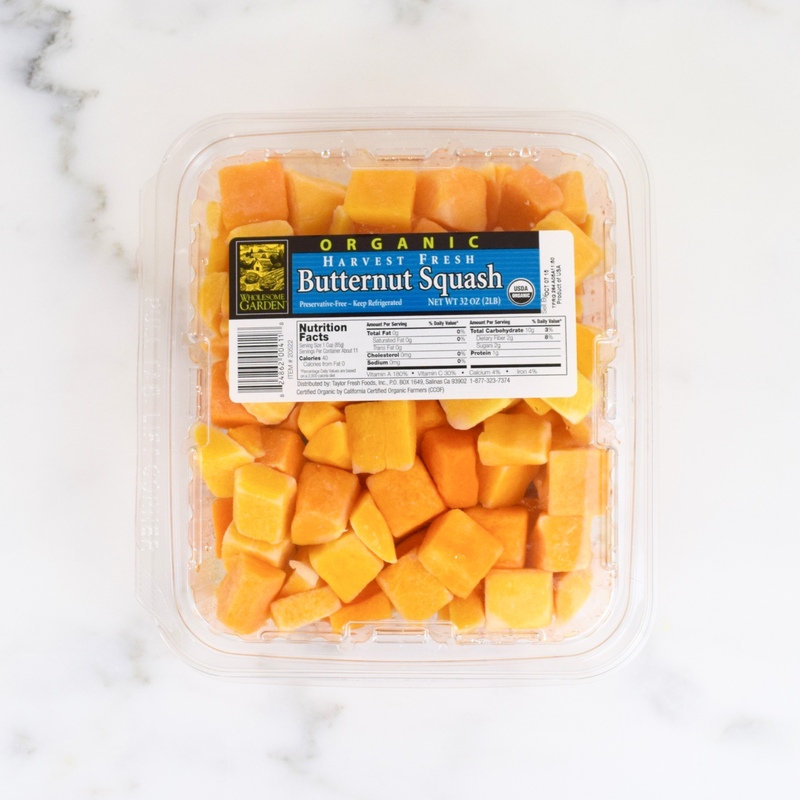 I have become a fan butternut squash, since I started to blog! Thanks for commenting!